As Dechen Dolma Lama prepares to graduate with a bachelor’s degree in child and youth care, she recalls the time and effort spent just getting to Vancouver Island from Nepal by way of Zurich, Switzerland. Gaining entrance to a sponsoring boarding school is a minor miracle for any Nepali girl, she says. The cultural norms at home favour education for boys and early marriage for girls. Lama, however, was an outstanding student. She would go on to be one of four of 840 students to earn a full two-year scholarship with Inter-Community School, an international college based in Zurich, Switzerland. Today, when asked her age, Lama pauses. “I’m 25 but, at home, we follow the lunar calendar,” accounting for a difference of 275 fewer days. Home is Lho village in the Nubri region situated about 12,000 ft. above sea level where people follow the sun and the moon to track time. The serenity of this place belies the hardships locals face as seasonal nomads and subsistence farmers. Parents work the fields while children forage for firewood, tend livestock and subsist on two meals a day, “if they are lucky.” Butter tea and a bread of roasted barley flour are diet basics. Now the eldest of six, Lama’s older sister died of hunger. She explains how mortality is very high among infants, children, and youth. “There is no sanitation, no healthcare, no electricity, no running water. To access the nearest road is a five-day walk.” While most cannot read or write, save for nuns and priests, the rural Nepali people are genius in subsisting within such a meagre, challenging, yet enduring environment. Lama is living testament to this perseverance having worked hard labour as a child yet persuading family and local monks to let her attend school. As is the way, she has vowed to return and help her community and her school as payment for the privilege of her education. 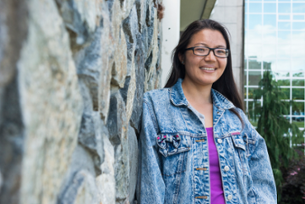 Lama hopes to return to UVic, earn a master’s degree, and work with families new to Canada. Thanks to all those alumni and staff who joined the February 2018 SCYC alumni reception to make it another success! Congratulations once more to Anne van Beers - Recipient of our 2018 SCYC Exemplary Practicum Supervisor Award. Plan now to join us in February 2019. Specific dates and registrations will be available in January 2019.